It's my third time to undergo shoulder rehabilitation and this time, it's my left, post arthroscopic shoulder surgery. The first time was for left frozen shoulder and the second time was for anterior bicipetal tendinitis on the right shoulder. In all these 3 physical therapy sessions for the shoulder, I've used various physical therapy equipment like Therabands, physical therapy dumbbells and the finger/shoulder ladder. After being discharged by the rehab doctor, it is usually recommended that I continue the therapy exercises at home. I usually don't have trouble with that arrangement. Although I don't have Therabands at home, I do have stretch cords and some of the therapists during rehab are surprised I'm able to continue the Theraband exercises at home. These stretch cords were purchased from a sports/hobby store and, ironically, were for the purpose of regular strength training, and not physical therapy. For dumbbells, I've always relied on equipment I use for strength training at home. I have a collection of cheap weight plates in various sizes and two pairs of home gym dumbbell bars with the screw-on collars. I also have a pair of wrist weights or dumbbell cuffs, in case I wanted my hands free as I exercised. Although the finger ladder (or shoulder ladder) is a basic shoulder therapy device, you'd no longer be needing it by the time you're discharged by the rehab doctor. 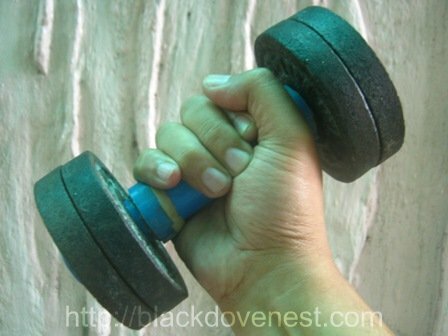 The adjustable dumbbells I use at home are not only used for shoulder exercises. Other upper body therapy exercises where I've used the adjustable gym dumbbells include therapy exercises for tennis elbow. I've also devised a wrist roller exercise for an adjustable dumbbell to address tennis elbow. So why the need for making a physical therapy dumbbell, if I already have a couple of regular adjustable gym dumbbell bars? Physical therapists draft a set of exercises that address specific problems of the patient. In my previous 2 shoulder problems, none of the exercise sets were the same. This third one is no different. In fact the shoulder exercises instructed by the physical therapist were done lying on the physical therapy table. Of course, at home, I had to do these lying shoulder exercises on the bed. I immediately noticed that my old gym dumbbell bars just wouldn't do because the dumbbell bars had long sleeves that would scrape the surface of the bed as I performed the exercises. Occasionally, they would also brush against my thighs and shoulders. This is where the physical therapy dumbbells are preferred. They are much more compact and allow freedom of movement. They don't have the protruding dumbbell sleeves that hit the body or other objects. Physical therapy dumbbells that are found in rehabilitation centers have accurate weight measurements. For regular gym dumbbells, however, you'd have to add the dumbbell bar's weight for the total load. My gym dumbbell bars weigh around 2 to 3 lbs. Considering weights being used for upper body shoulder exercises isn't very much, the dumbbell bar weight is already significant. Simply holding the plates, without a dumbbell bar isn't a viable option. I've tried inserting my fingers in the plate holes and was able to hold 2 plates. Holding 3 plates was cumbersome, and virtually impossible for 4 plates. So the already heavy gym dumbbell bar needs to be replaced with a bar with an almost negligible weight. I wanted to continue using my set of weight plates but didn't want the dumbbell bars that will be awkward to use. So I fabricated my own physical therapy dumbbell bar using light materials.